DigiTour Stars Play 'Speak Up' In Seacrest Studios Washington, D.C.
Our favorite stars from Instagram, Musically, Youtube and SnapChat hit the road for DigiTour Winter and made a stop in our nation’s capital! 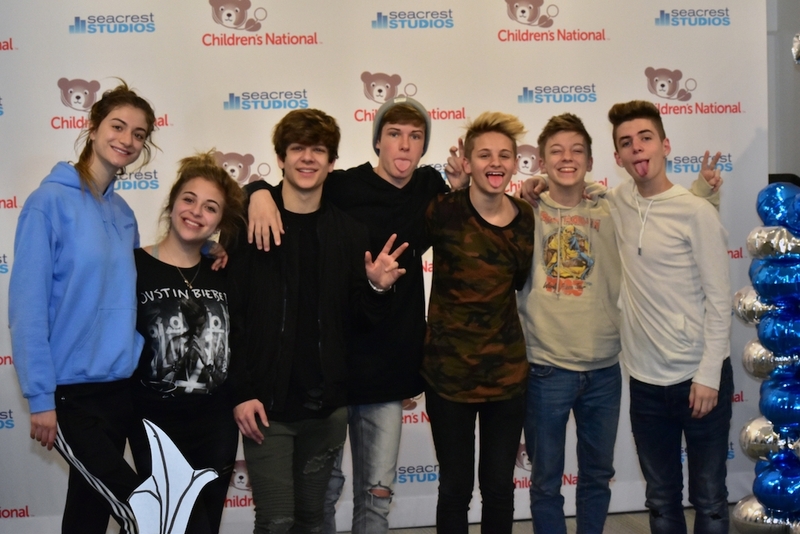 Blake Gray, Weston Koury, Baby Ariel, Mark Thomas, Sophia Kameron, Zach Clayton, and Nathan Triska visited Seacrest Studios at Children’s National and had patients and families smiling the entire time! We kicked off the visit with questions from patients. They all shared what life was like before they were social media stars and how some of their lives changed overnight. Combined they have more than a million followers on social media, but despite their popularity, they all agree that they are typical teenagers. “We like to go the mall, hang out with our friends, be regular teens”, said Baby Ariel. Patients were eager to watch our new friends play a game of “Speak Up” where Mark and Zach tried to read hilarious and outrageous phrases with a dental spacer in their mouth. The game was such a hit that Mark even asked if he could take the spacer home to play with his friends! They topped off their visit with a friendly challenge of “Dress Up” where they competed to see who could put on a hospital gown, gloves, and mask the fastest. Patients enjoyed learning how much they had in common with the social media stars and we can guarantee that they gained more followers after the awesome visit! Thank you Blake, Weston, Baby Ariel, Mark, Sophia, Zach, and Nathan for taking time out of your tour to visit us at Children’s National!